Infant GERD (gastroesophageal reflux disease) or acid reflux has become increasingly common since the 1990s. According to recent estimations, children aged 3 to 17 years old suffer from acid reflux symptoms roughly 2% to 8% of the time, whereas among infants the percentage of sufferers reaches 20%. Those infants who suffer from developmental or neurological disabilities are more prone to gastroesophageal reflux disease. Prior to discussing the causes and risks of GERD in babies, let's take a brief look at the local immediate cause behind this medical condition. Acid reflux, in simple terms, is a malfunction of the digestive system. The most common contributing factor is the weakening of the LES. When the muscle called lower esphogeal sphyncter (LES) is too weak to keep the gastric contents in the stomach, those contents move into the throat and sometimes past the larynx into the upper airway. While reflux may also occur when there is normal LES pressure, such as after meals, crying, defecating, and coughing, in the case of gastroesophageal reflux disease there can be serious health complications involved such as pain, infections, ulcers, eating problems, voice issues , and even cancer. GERD diagnosis could be especially challenging in babies. Infants are predisposed to "spitting up or vomiting" more than adults, because of the small reservoir of their esophagus. Most infants experience some kind of regular vomiting - mild to moderate spitting up - from the mouth or nose without pain or discomfort. It usually happens during or right after feedings. Because of that fact, GERD can be easily confused with normal vomiting. Moreover, clues to what is wrong with the infant can be difficult to figure out, since newborns do not have the verbal ability to explain themselves. When your infant has GERD , several additional symptoms usually appear. For example, since GERD related vomiting could be painful, babies might have this disorder if they vomit too often, scream or cry for hours, or permanently awake at nights. Additional symptoms include adenoid enlargement, abdominal pain, chronic cough, middle ear infections, anemia, asthma, hematemesis (vomiting of blood), high-pitched sound when breathing, repeated croup, back arching and nose/sinus inflammation. Neglected acid reflux in newborns can be dangerous and may lead to severe complications. If an infant associates feeding with pain, he or she may refuse breastfeeding, thus losing weight. Moreover, gastroesophageal reflux disease can lead to potentially serious complications such as erosive esophagitis; that's why early diagnosis and treatment are necessary to ensure your infant's safety and well-being. The best way to achieve an accurate diagnosis for baby acid reflux is by seeing a gastroenterologist or an ENT (ear, nose, throat) doctor. Once diagnosed with gastroesophageal reflux disease, the newborn's parents must choose a treatment for him/her. The treatment options for infant GERD can be divided into three categories: surgical intervention; prescribed medications or over-the-counters; and holistic therapy. A surgical procedure called a Nissen Fundoplication may be performed to tighten the juncture of the esophagus at the stomach. However, surgical intervention is rarely considered, since its complications may be more severe and carry a greater risk compared to the acid reflux condition itself. 1. Medications are aimed at tackling the GERD symptoms (i. e. acid production) while neglecting its root causes, such as the lifestyle, internal and dietary triggers and factors. 2. The use of medications may not be completely safe when it comes to adults and especially newborns. Several prescribed reflux medications, such as reglan and bethanechol, have not been tested for use with babies. Another medication, cisapride, discovered as having a serious side effect of heart arrhythmia and has been removed from the market. Several other common medications have even more serious side effects, such as pneumonia and Tourette's syndrome. 3. All types of medication can cause a long-term dependency and compromise your infant's immune system, resulting in a weak and vulnerable immune function that can aggravates the baby's condition. Did you know that the optimal way to protect your infant from the distressing and painful GERD symptoms is by adopting the holistic approach while focusing on a comprehensive set of all natural lifestyle and dietary changes? 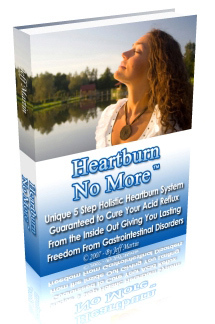 Recent researches provide consistent support to the holistic all natural treatments of GERD. For example, a research that was conducted by Ravelli, Tobanelli and Volpi and published in Journal of Pediatric Gastroenterology and Nutrition in 2001, revealed that cow's milk based formula can produce delayed gastric emptying among infants who have milk protein allergy. A research by Rudolph, Mazur and Liptak that was published in the same journal demonstrated that a change from a cow's milk based formula to a casein hydrolysate formula might benefit formula-fed infants who are vomiting. Finally, it was found that for infants with GERD breastfeeding has significant advantages over any baby's formula, since breast milk has elements that promote better digestion and faster emptying of the stomach. The findings mentioned above and many others strengthen the theory that infant GERD in not a local condition (concerning the esophagus only) but the body's response to a set of internal, environmental and dietary factors. For this reason, the holistic medicine approach aimed at protecting your baby from gastroesophageal reflux disease can be not only safe but also the most effective long-term choice.